Q. What is LD, DC & PR? A. LD= Laundry, DC= Dryclean, PR= Pressing. we say laundry/dryclean service, it also includes pressing by nature of the service. Q. What is the basic process difference between Laundry & Dryclean? A. Laundry process based on water & various types of detergent/cleaning agents. Dryclean process based on liquid Chemical ( Perchloroethylene / Solvent). Q. Is there any possibility of color fasting if we send any cloth for Dryclean? A. If your articles’ color is not permanent, the color could be fastening. But- it will be less than the Laundry process. Q. Is there any difference in pricing for different shops of TOPCLEAN? A. No, all TOPCLEAN shops offering service with the same price. Q. If I get ID # from a shop of TOPCLEAN, can I use it to other shops? A. Yes, once you get ID # from any TOPCLEAN shop, you can use it to all Topclean shops. You just need to use your full ID# (Minimum 6digits, i.e.- 001039). Q. What is the benefit for using same ID# in different Topclean shop? A. If you use your same ID# at different TOPCLEAN shops, your total service quantity and amount will be accumulated under the same ID#, which will help you while we will offer any special discount or special gift to our valued clients. It will also help you to find out your garments which remain as a stock in any of our shop. At the same time when you need to know your delivery service status, you can know it by entering same ID# in our web page. Q. Does TOPCLEAN give any guarantee to remove the spot from any cloth? A. Sorry, TOPCLEAN does not give any guarantee to remove the spots/stains from your cloths. Topclean gives its’ best efforts to remove the spots, some time it could succeed and some time it could not be - due to possible risk of damaging the color or fabric of the article. Q. Is their any extra charge to Hanger the articles? A. No, there is no extra charge for this. Hanger (H) and fold (F) both services are depends on clients’ preference. But if any client mentions his preference of F/H at the time of Voucher Preparation, and later he changes his preference, he has to pay for the change. Q. How can I know about my Voucher/Article delivery status? A. 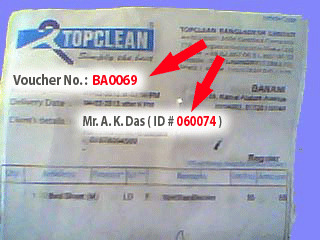 To know your desired Article’s delivery status, please visit our website (www.topcleanbd.com). You need to enter your full ID # (Minimum 6digits, i.e. - 060074) and voucher # (i.e. - BA0069) Help. Q. Is there any Topclean shop at out side of Dhaka City? A. No, there is no one. Q. I have heard that TOPCLEAN is a joint venture company with Singapore, is it so? Q. If I want to do business with TOPCLEAN as franchise partner, what should I do? A. First, should contact marketing department of Topclean to know the lucrative place to open a shop. Second, you need to find out a suitable place for a Topclean laundry shop, preferably ground floor with 300 sft rectangular shape shop convenient for clients’ to drop and collect garments/lines. Third, sign a mutual franchise agreement with Topclean and complete shop decoration as per Topclean standard. Fourth, at the time of signing the agreement a security deposit of Tk. 300.000.00(Three lac) must be handover to Topclean. Q. What happens If you lose/damage any of my cloth?